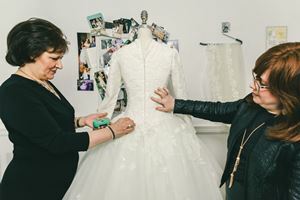 When Rochel Leah Katz, a consultant at iconic New York bridal boutique Kleinfeld, was hired for her job nearly 16 years ago, she assumed the position would be temporary. Katz had no formal education in fashion, much less bridal fashion. But in her tight-knit, Orthodox Jewish community in Brooklyn, she’d always been known by family and friends as “that person” to take along to fabric shops and dressmaker appointments. In 1999, Kleinfeld’s current owners, Mara Urshel and Ronnie Rothstein, bought the then-struggling store and an investor and mutual friend suggested they bring on Katz to work with religious brides. Not only did she have a knack for bridal style, she also understood how to incorporate the rules of modesty into wedding looks. Read the full story at Racked.com.